This is how the Punchayat Elections were conducted in West Bengal and where Mamta Banerjee recorded her victory. TMC goons resorted to unfair means to ensure party's victory, and country's secular forces, media and intellectuals preferred kept quiet and rather paid their attention to Karnataka where a lucky JDS is going to form government, despite their least number of seats, and to ensure the victory of the democracy, as the joint opposition has termed it. 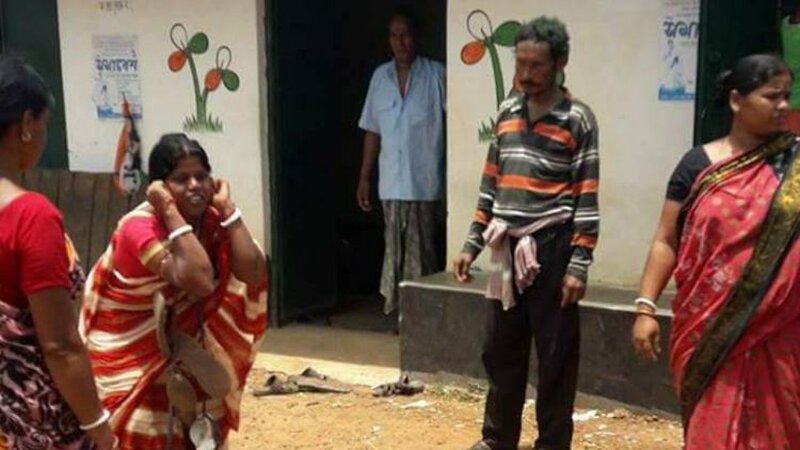 In West Bengal’s West Midnapore district, goons of the ruling Trinamool Congress (TMC) allegedly made a woman with a garland of shoes around her neck do squats more than 100 times holding her ears, the Indian Express has reported. According to the report, the incident came to light after a photograph of the woman went viral on social media on Saturday. Media in-charge of Vishwa Hindu Parishad Sourish Mukherjee tweeted the picture, saying she was punished for not voting for the Mamata Banerjee-led TMC in the Panchayat polls. However, according to a report in TheWeek, she was humiliated for opposing booth capturing and rigging by members and activists of the ruling TMC. “My wife showed the sandal she was wearing. She asked them not to engage in rigging,” the woman’s husband, Gopal Patra, said. “This is like Taliban punishment. I will stop doing my political activities,” he added. According to the locals, Patra, a former panchayat samity member of TMC, was also beaten up by the goons over disagreement on an issue. When the husband did not come home for long, the woman too went to the TMC office. “The woman was then asked to apologise and squat holding her ears. The incident was captured on camera by TMC workers,” a local told the daily. West Midnapore TMC President Ajit Maity has said that the picture isn’t fake. However, he added that no TMC worker was linked to the incident. After the panchayat elections were announced, opposition parties had said that TMC goons were preventing their candidates from filing nomination papers by threatening them. During the panchayat elections, the party was accused of resorting to violence, booth capturing to get favorable results.